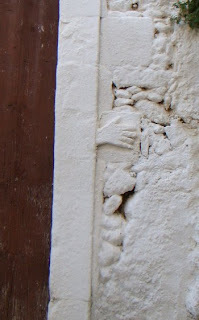 There is a stone hand on either side of a door in the Venetian town of Maroulas, south-east of Rethymon. The town has few inhabitants: mostly it is walls and carved arches, and two massive fortified towers with entrances that have to be reached by ladders. One dates from the 1300s, one from the early 1600s. Venetian Crete is mostly seen by tourists, and seen as madly, charmingly picturesque. But there are other sides to this colonial culture, complex and often disturbing. The fact that some Venetians colonists felt they had, even in a town, to live as if under siege is in itself disturbing. The reasons why are far more disturbing. Nothing is known about Maroulas, but the guidebook tells the story of what happened at Alikianos. The story comes from a Venetian chronicle and one can hope that at least some of it is untrue. A group of towns in the province of Chania rebelled in the late 1500s and set up their own governor by the name of George Gadhanole. Gadhanole presently came to the tower of Francesco de Molin who held one of the Chania fiefs, and asked for a marriage between the de Molin daughter and his son Petros, "the best and the bravest of all my sons." He might have reconsidered had he been able to read Latin: over the de Molin portal was inscribed OMNIA MUNDI FUMUS ET UMBRA. Everything of this world is smoke and shadow. The marriage was arranged. The de Molin guests arrived from Chania in droves. There were presents--fabulous fabrics the Chania patrician merchants had acquired in Egypt and Syria and Constantinople. Dozens of pigs and bulls were roasting. The Gadhanole family arrived with three hundred men. The celebrations began in the morning and continued into the evening. Then they spotted a fire from Chania. This was the signal for the de Molin guests to turn on the Gadhanole guests. By the time the troops arrived from Chania, the rebel Gadhanole and his three hundred men were trussed for slaughter. At dawn the troops hanged George Gadhanole, his son Petros, and another son. Others of the family were shot. The three hundred were divided into four groups. One group was taken to Chania and hanged. Another group was hanged at Gadhanole's home village, Chrystogerako, which was then burned and flattened. The other groups were hanged at Apokorona and on a mountain near Lakki. That was the first act of reprisals against the rebels. The Venetian chronicle recorded that this was greatly consoling to those who had been faithful to their God and their Prince. The second act began with the appointment of a new governor for Chania, named Cavalli, with full authority to extirpate the rebels -- "l'estirpazione degli uomini seditiosi." Cavalli took troops at night to the nearby rebel village of Fotinakko and set fire to it. At dawn they hanged the twelve leading men, and to be sure the lesson was learned, ripped open four pregnant women and battered their infants. The chronicle said that this spread terror across the countryside, and that they deserved worse. For the third act, Cavalli sent word to the rebel villages that anyone who wanted to make submission and avoid the same or worse was to bring him the head of his father, or son, or cousin, or nephew. In due time, a priest of the Pateri-Zapa family arrived with two sons and two brothers. They threw down five heads before Cavalli: one belonged to a son of the priest, one to a brother, one to his father-in-law, and two to his nephews. The identities were attested to by witnesses. The story is from Candia Veneziana, M. Buonsanti & A. Galla (Heraklion, 2004). Carvings from Francesco de Molino's Chania palace can be seen in the Byzantine/Post-Byzantine Museum in Chania. At some time in the 6th century, Ariadne's brother had a gravestone with an inscription carved for her in Constantinople and brought out to a basilica near a magnificent spring on the road near Argos. It was a magnificent spring for thousands of years, the spring of Kefalarion, and was magnificent until nearly thirty years ago when greed and the spirit of modern Greek progress required that it be pumped dry for irrigation purposes. This basilica, carefully ignored since it was excavated nearly 40 years ago, was dedicated to the Apostle Paul, located near where Pausanias had seen the worship of Dionysios and Demeter. It must have been a splendid place, large enough--45.5 m long and 23m wide--and elaborate--with walls lined with coloured marble, gold tesserae, frescoes, stained glass, and carved sarcophagi--enough to have been an imperial or consular bequest. This Doulkitios can be dated, within a rather broad period. The writers included in the Cycle have been dated as writing between 530 and 565, which may then suggest the earliest and the latest reasonable dates for his death, and so for Ariadne’s. Ariadne's Doulkitios provided--and very likely wrote himself--her metrical epitaph with echos of epic verse. It was the way the intellectuals wrote then. One fragment, in the Greek, seems quoted from Andromache in Book 6 of the Iliad: "You, Hektor--you are my father now, my noble mother, a brother too," while two other words seem taken from "willows whose fruit dies young" at the entrance to the world of the dead in the Odyssey--an image one would expect Christians to avoid, but the area of the basilica was thick with willows. 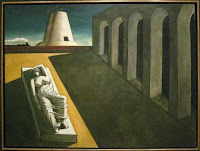 "Sleeping Ariadne" itself makes reference to myths of Dionysios, whose worship had been expelled from Argos and Kefalarion about a hundred and fifty years before. It is tempting to think of Ariadne as young and, naturally, lovely: no evidence compels us to assert that she was not, but she is more likely to have been a mature woman when she died. She had a strong connection to Argos -- the inscription calls her "of the Argeians." Her bones were buried elsewhere first, then moved to an osteotheke in the apse of the Kefalarion basilica. I prefer to think, with no further evidence, that the proconsul Doulkitios was Ariadne's Doulkitios, and so proconsul of Achaia. Any proconsul had to know the area: going from Corinth to Sparta, which a proconsul would have to do, he would travel the road past the spring, and would certainly stop to cool off there, maybe visit friends. Remains of Roman villas have been found in the vicinity. This is, in translation, what remains of Ariadne's epitaph. † Blessed Paul, holy Apostle . . .
of the Argeians destroyed . . .